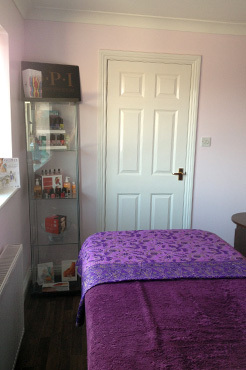 I have specialised in Advanced waxing since 2005, and have many happy clients under my belt! I aim to stay at the top of my game and give you the best wax experience possible. I have also had the great pleasure to train with the “wax queen” Kim Lawless in Extreme Waxing, and using the premier waxing brand Perron Rigot, this gives a treatment that produces excellent results as painless as possible. OPI nail care products are used for all Manicures and Pedicures. This gel strengthens and protects the nails allowing a natural nail growth. Applied on pre-prepped nail and cured under a UVA light, thus leaving the nail strong but flexible with a glossy finish. The “Original Power Polish” that goes on like a polish over your natural nail. Lasts like a gel and doesn’t smudge or chip. Soaks off in minutes. Nail wraps which are a solid film with adhesive backing that is applied and removed using heat. Wide range of colours/patterns are available and can be pre-ordered if not held in stock. * Ladies are advised to bring open toe shoes to wear home to avoid smudging polish. A build up of hard skin and calluses on the foot can be uncomfortable and unsightly. the special Callus Peel Treatment will leave your feet soft, and feeling rejuvenated. The Callus Peel is applied to the problem areas allowing calluses to be scraped away quickly. This treatment takes just 30 minutes and you can see the results right away. Your feet will be wrapped in a unique skin softening patch by Callus Peel, which amazingly softens hard and callused skin. The dead skin is then scraped off with a special plastic scraper, followed by a skin polish to smooth away any remaining hard skin. The treatment is then followed by a massage with a rejuvenating cream, which will deodorize and relax the feet. If the callus is very hard, another treatment may need to be carried out a few days later. Is Callus Peel suitable for everyone? Callus Peel cannot be used whilst pregnant or on anyone with diabetes. Individual lashes are Semi Permanent and can last up to 8-12 weeks with regular maintenance. The initial appointment can take up to 2 hours dependant on the clients lashes. A patch test will need to be carried out at least 24 hours prior to the Treatment. Do not wax or shave 24 hours before treatment do not moisturise on the morning of the treatment.